GAINESVILLE, Ga. (AP), August 06, 2006-- On a hazy summer day, a plane buzzed high over the green mountains in Union County. Someone once told Sylvia Dyer Turnage, "We flew over your place." Her comment: "Don't think you're the first guy to do it." That's because she and other family members are convinced that her great-great-grandfather, Union County mountain man Micajah Clark Dyer Jr. created a machine that carried him in the air, years before the Wright brothers lifted off the beaches of North Carolina. No one knows what convinced Dyer to embark on a quest to fly. But for decades, his descendants have been on their own quest - to find out what he knew about aviation - and what he did. "I would just put my life on it that it's a true story," said Roma Sue Turner Collins, who said her grandmother, a Dyer, saw the craft airborne. Family members are hoping someone eventually will build a full-scale version of his machine, listed as Patent No. 54,654 as his "Apparatus for Navigating the Air." There is talk of including his work in a 2007 exhibit at the Museum of Aviation at Robins Air Force Base in Warner Robins. 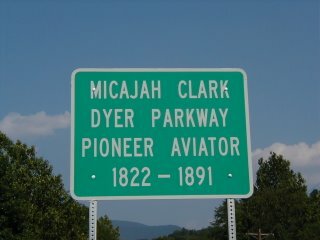 The legend even prompted State Rep. Charles Jenkins, D-Blairsville, to sponsor a bill naming a stretch of Georgia 180 near Blairsville as Micajah Clark Dyer Parkway. The road's name was changed after a May 31 signing by Gov. 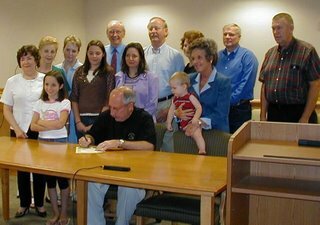 Sonny Perdue at the state Capitol. Dyer's design looks like a small boat under a tube-shaped balloon. There are three flap-like wings on each side. 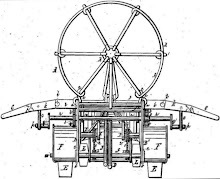 Dyer wrote the craft can be run by steam or other power, in this case, paddle wheels. He was the subject of an article in The Gainesville Eagle in July 1875, months before his patent was approved. The short newspaper account described the craft and noted the farmer's confidence that he had "solved the knotty problem of air navigation." It also noted that he'd studied the problem for 30 years and tried and failed. Until he came up with the design of the flying ship in the patent. Dyer wasn't your typical "dirt" farmer of the area. When family members a few decades ago began backtracking the stories about him, they found he created a gravity-fed system to pipe water to his log home, likely the county's first indoor plumbing. Other family members recalled the logs in his cabin were hewn to a precise fit and his yard was strewn with gadgets. All this from a man who might not have gone to school or even read more than the family Bible. But it was his entire life's pursuit of flight until he died in 1891 at age 68 that baffled his peers. "The neighbors thought he was loco," said Turnage. "They couldn't understand why anybody at that time would spend such time on a wild idea." But worldwide, the quest to create the flying machine was growing. 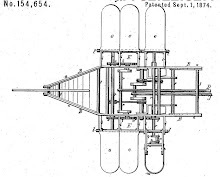 Pages of U.S. patents involving aviation from 1799 through 1909 fill an online database. Dreams of flight were shifting from balloon flights in the 1780s to the 19th-century concept of heavier-than-air, fixed-wing craft containing a propulsion system and moveable surfaces for control. "Serious, established engineers ... were starting to take aeronautical investigation seriously," said Peter Jakab, aeronautics division chairman at the Smithsonian Institution's National Air and Space Museum in Washington. The Wright brothers are credited with building the first fully controllable glider in 1902 and after adding a gas engine and propellers, Orville Wright recorded what's widely considered the first sustained, powered flight in a controllable heavier-than-air aircraft on Dec. 17, 1903 at Kitty Hawk, N.C. But Dyer family members believe Dyer followed a different design to reach a similar end, but decades before Wright's flight. They believe Dyer flew after adding a propeller turned by a clock spring to a scale model of his craft. Jakab said the balloon in Dyer's design does not appear to be large enough to lift the craft and the flappers, as opposed to fixed wings, were "one of the great barriers" to advancements in flight, because the physics don't work for heavier-than-air aircraft. Although experts continue to wonder about Dyer's flying machine, Turnage does not. She considers that mystery settled. Asked if she doubts that Dyer flew, she said, smiling but firmly, "Oh, no."